Instead of just shopping at Bangkok, I did something far more exciting: joining a cooking class at Le Cordon Bleu. I’ve learned to make many dishes such as delicious pork skewers. We made many curry and pastes, such as the complicated massaman curry. Despite all of them being mouth-watering, most are incredibly difficult to make or time-consuming. The list of ingredients are so long, and the process so tedious that I doubt I’ll be making it daily. As I believe in cooking more at home, naturally I prefer simple recipes. Thankfully the cooking class offered one recipe that is perfect for home cooking: the versatile salad dressing for spicy tropical mixed fruit salad. When I hear the word ‘salad dressing’, I immediately think of balsamic vinegar and olive oil. Not only these ingredients are rather pricey in Asia, it’s just not quite suitable to pair with the other Asian dishes I like to cook. Besides, I’m not a big fan of raw vegetables (i.e salad). Besides I think good salad are hard to come by; most taste rather bland and one-dimensional. If you’re like me, you will enjoy this salad dressing which teases your taste buds with an amazing combination of umami, sour, sweet and salty. This dressing makes vegetables taste so delicious! A delicious salad dressing for fruit salad. Step 1 Dilute 1 tbsp of ready-made tamarind paste in 350 ml of water. Step 2 In a pot, add all ingredients except lime juice and bring to a boil. 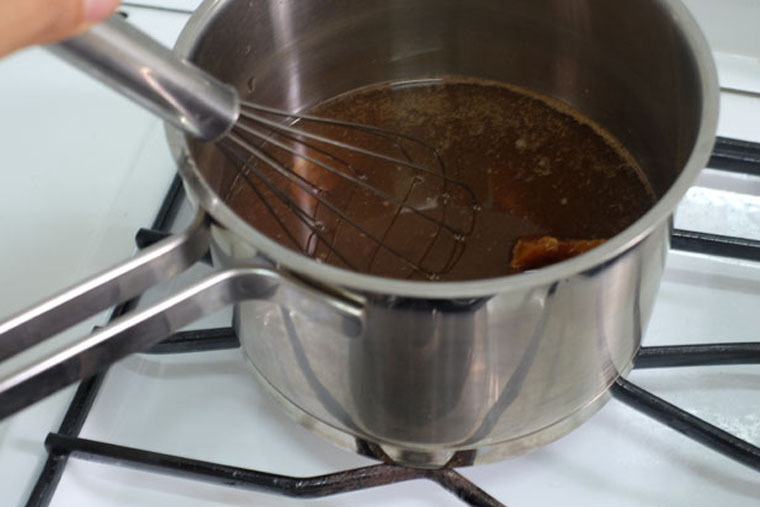 Step 3 Simmer until ingredients are melted. Step 4 Add lime juice. Step 5 Cool and store in the fridge for up to 1 month. Pour dressing over any salad. 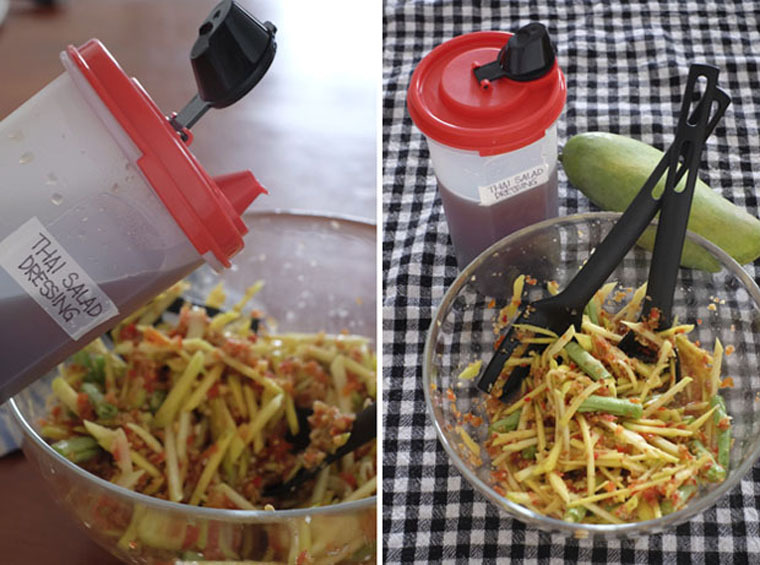 Try my favourite Thai Spicy Mango Salad. 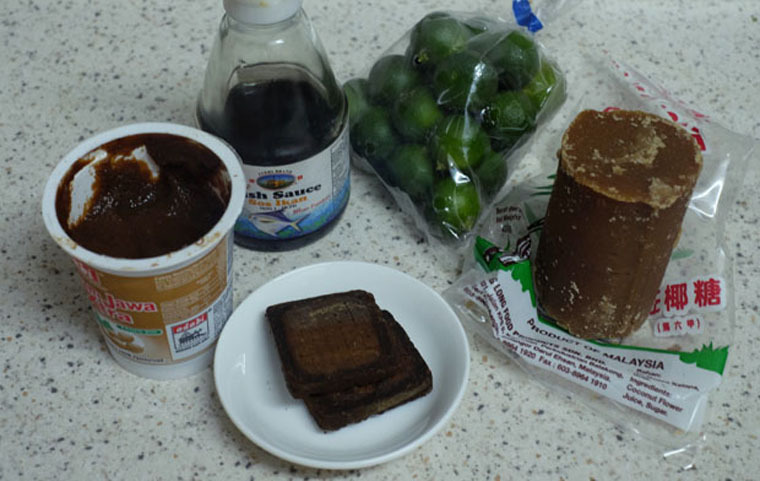 Boil and simmer 1.5 cups water + 1 tbsp tamarind paste + 100 ml fish sauce + 150 g gula melaka + 1/2 tbsp shrimp paste. Simmer until all ingredients melted. Add 1.5 tbsp lime juice. Cool. The saltiness of fish sauce and shrimp paste varies. Do adjust the amount accordingly. 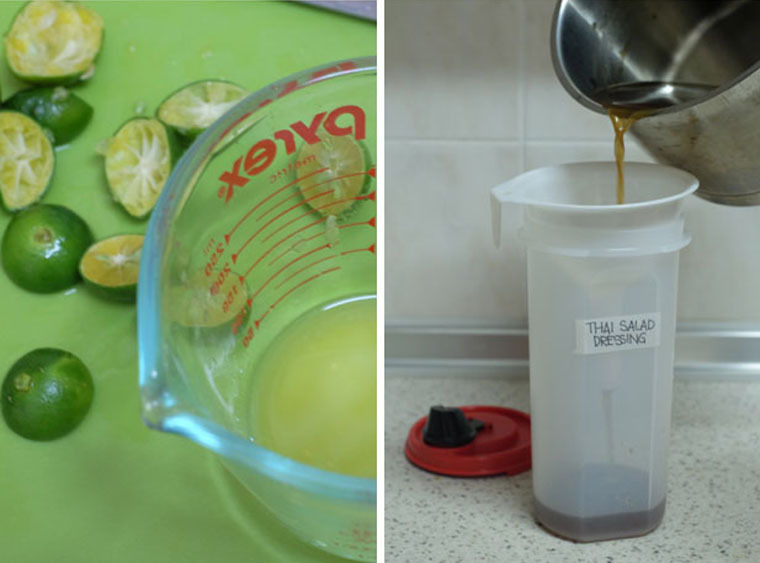 Depending on how salty or sour you like the dressing to be, add more fish sauce and lime juice respectively. This recipes makes a big batch of salad dressing. 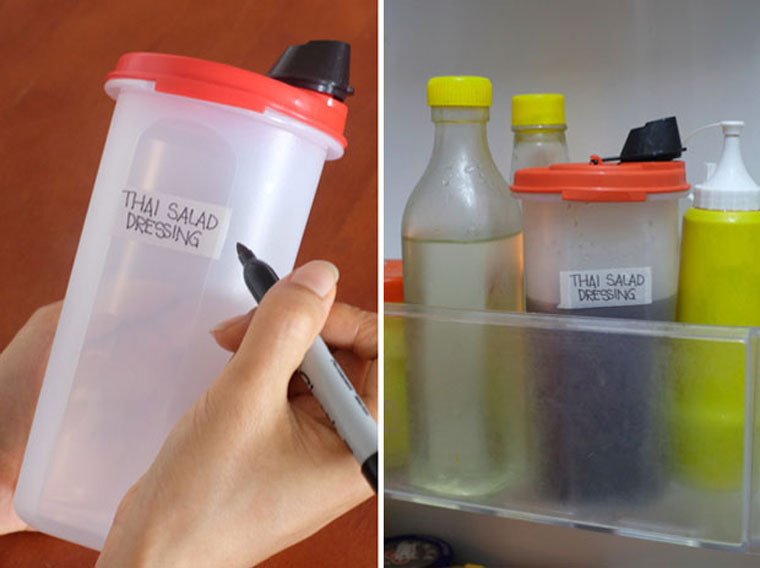 Transfer it into a bottle, label it and keep it in the fridge. 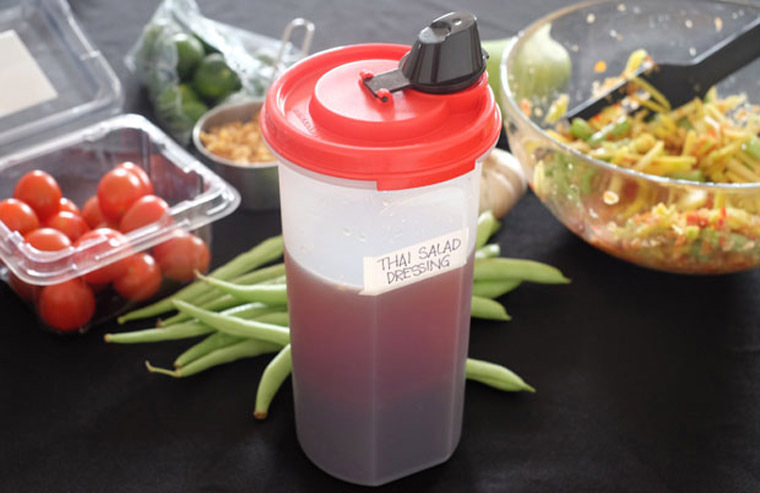 If made and stored properly, this salad dressing can last to up to a month or longer. I’m trying to incorporate more vegetables into my diet. If you have a good recipe, please drop me a line below!